Why do states form, and why do they collapse? The French revolution. Public domain. Today the people of Scotland will go to the polls and decide to keep or divide the United Kingdom. It is an act of monumental significance: firstly for the important precedent of the peaceful and lawful exercise of the right to self-determination; secondly, for the immediate consequences of their decision on one of the most important states in the world; and lastly, for the vast repercussions that this vote will have across the globe. Regardless of the outcome, but especially if "YES" wins, the post-World War 2 order will be irrevocably changed. Entrenched elites will rightly tremble and complacent leaders in many capitals will question whether their "settled" borders are indeed as safe as they thought. Always there is an underlying contempt and incomprehension which springs from a clash of identities. This clash is particularly dangerous and intractable for many reasons. For one, it can permanently alter perceptions of identity. Individuals can hold many identities simultaneously: gender, religious, national, tribal, ethnic, linguistic and other identities can and do peacefully coexist in everyone all the time. There is no inherent contradiction in feeling both Scottish and British, Catalan and Spanish, American and Virginian. But when politics sets two identities against each other, individuals begin to make a conscious choice between them: and that choice involves where and to what these individuals give their loyalty. Eventually, this process becomes almost irrevocable for all those who live through it. The other danger is that it turns fellow citizens into "the other", a designation which provokes a primitive and visceral response in human beings. The "other" is the enemy, the threat, one who resides outside of our circle of light and friendship. They are precisely the ones we are perfectly willing to fight and kill. When that happens, the polity falls apart. It is therefore worthwhile exploring briefly why states form and why states fall apart in order to understand the policy responses that can avert national fragmentation and the real possibility of civil war in some cases. It should be remembered that the modern nation-state model which is now dominant around the world is actually a very recent European innovation. For most of history, humanity has been organized along very different principles: multi-ethnic empires holding sway over heterogenous groups of largely passive masses through some form of divine right has been the norm around the world. Uniformity of language, of religion, or of ethnicity were never a requirement of legitimacy for these political organizations: the polyglot empires of antiquity made no such pretext. For most people it was enough to know that Caesar ruled by the power of Jove and the power of the legions. This began to change around the 16th century in Northern Europe, as literacy spread and with it an increasingly open questioning of the religious monopoly on knowledge and the power and riches that went with it. It is no accident that Protestantism took root in precisely those parts of Europe with the highest literacy rates; and that the rise of Protestantism in turn lead to increased literacy rates as children were taught their letters so they could read the Bible - an act strictly prohibited by the Roman Catholic Church for another three centuries. The increasingly fractious nature of this theological debate eventually led to a political schism in Germany between the Protestant Electors of the Holy Roman Empire and the Catholic Habsburg Emperor. The result was the Thirty Years War, a nearly genocidal conflict that turned Germany into a wasteland and ended only with the mutual exhaustion of every major and most minor powers in Europe. The offshoot of the war was the doctrine of cuius regio eius religio: “whose realm, his religion”. The religion of the ruler would be the religion of the ruled. From now on, European monarchs had carte blanche to repress, exile, torture and murder their dissenting citizens without fear of provoking a general religious conflict. The first step towards the nation-state was taken; but the states of Europe still lacked essential features of the modern state. The monarchs of Spain and France referred to themselves as "His Catholic Majesty" and "the Most Christian King" and ruled over a people that still spoke mostly mutually unintelligible dialects. A Parisian in 1648 would have had trouble understanding the accents of his Breton or Gascon countrymen, much less of the Provençal and Occitan of the Mediterranean coast. The same could be said of a Londoner, a Madrileño, a Florentine or a Berliner. The culmination of this trend came during the Wars of the Coalitions against Republican France. [iv] The latter, which had purged, exiled or executed most of its professional officer corps, faced the need to quickly raise and organize armies to turn back multiple invasions by the monarchical forces arrayed against her: the French revolutionary leaders turned to the levee on masse, which was a precursor to the nation in arms. Every able bodied Frenchman became a defender of the revolution and a defender of France; military service became a patriot duty of the citizen, a reintroduction of a Greco-Roman concept disused for over 1500 years. France's armies of citizen-soldiers swept to victory and France's sons were swept together for the first time; millions of Frenchmen who would have lived and died in their villages if it had not been for the Revolutionary and Napoleonic Wars. It was war and army life that turned these people into Frenchmen and gave birth to the modern ethno-linguistic state. At the same time, the hostility of the French Republic to the Catholic Church de-emphasized the need for religious uniformity, though it remains a potent force to this day. Linguistic homogeneity gained in importance by the spread of Enlightenment principles in science and education as well as the rise of nostalgic romanticism, which rejected the pure logic and rationalism of the Enlightenment for a "purer" past of unsullied antiquity. This may seem a strange and contradictory combination, but they were not. "Enlightened despots" recognized the benefits of an educated middle class to spur industrial growth and economic growth as nations competed for power and security; meanwhile writers, philosophers and artists were rediscovering or inventing the cultural, musical and artistic heritage of the Volk. Even as literacy rates began to climb across most of Europe, the newly educated bourgeoisie and their children were being formed on new national myths that not only served to transmit a standardized version of the national language, but also to create a national identity were none had existed before. It is relevant to note that every single nation-state in existence today underwent this process of homogenization and myth creation, including "historic states" like France, Spain and England that have "existed" for centuries. If you had asked a random Spanish peasant in Castile in 1700 to tell you their nationality, they would have stared at you for a long time before answering that they were from Burgos and, of course, a Christian (meaning Roman Catholic). The concept of "Spaniard" did not exist in our modern sense until the end of the XIXth century. [v] The same is true of the "Germans" and "Italians": it was the Franco-Prussian and First World Wars that forged modern Germans and Italians out of Bavarians, Prussians, Hessians, Venetians, Florentines, and Neapolitans. Some nations required an even more extreme myth creation process: modern Romania was formed by the European Great Powers in the 1840s out of Wallachia and Moldavia, two rebellious Ottoman dependencies which were too important to be absorbed by either Russia or Austria-Hungary. The new Romanians had to reach back into the night of antiquity to pre-Roman Dacia to establish a foundational myth, with the fight against the Ottoman oppressor as another unifying theme. So too the Czechs, the Serbs, and even the Greeks, whose classical Athenian forbearers would have stared to see a bunch of Macedonian, Thessalian and Epirot barbarians dignified with the name of "Greek", appropriately applied only to the civilized Doric, Ionian and Achaean inhabitants south of Boeotia, the Peloponnese and the coast of Anatolia. We see the same process today in proto-states like Scotland, Catalonia, Euskadi, Wallonia and Flanders; as well as in newly independent states like Ukraine, the Baltic States and the decolonized regions of Africa and Asia... the list is a long one. When unionists scoff and disparage these efforts at creating a national myth as indulging in historical revisionism and building a tissue of lies, they ought to reflect that their own national identities were built in exactly the same fashion only 150 years earlier. Political organizations have always been based on a clear set of principles throughout history: security from invasion and access to markets and resources. In a dangerous world, the direct and indirect costs of subjugation to a distant authority are balanced by the very real benefits of physical security from violent death as well as the wealth generated by a common legal and institutional framework, infrastructure and lingua franca. This conceptual framework easily explains the rise and decline of the Roman Empire: so long as the legions protected the border and the Roman government was neither to corrupt nor too fragmented, the Empire flourished. When the borders became porous and the Imperial economy fragmented the costs of maintaining the centralized state were no longer worth paying and local elites made better deals with the Romanized Germanic chieftains occupying Gaul, Hispania and Britannia. The Eastern Empire, with a stronger economy and military, managed to put off the day of reckoning for another 1,000 years. The modern nation-state has rapidly come to dominate the world system because is it highly efficient at maximizing the security and economic benefits provided by the centralized state while at the same time minimizing the costs of compliance and subjugation. Central to this efficiency is the concept of friction. Friction exists in every transaction between individuals and between individuals and other entities, like states or corporations. This friction can be considered a cost of doing business; and to the extent that any individual is capable of doing so, they would prefer to minimize their costs. The costs of frictions are increased by many factors: distance, differences in language, in culture, in religion, in legal frameworks, in currencies. If you have ever travelled in a foreign country you know how trying it can be to make yourself understood or conduct business there. In a multi-ethnic empire, these costs are borne by many of the citizens within the state, implying that the benefits provided by that state must be correspondingly higher to justify the additional costs. When those costs are no longer perceived to be covered, independence movements result. Just as the costs of union tend to limit the maximum size of states, the costs of military defense and economic viability has tended to limit the minimum size of states. All things being equal, and with God on the size of the bigger battalions, small states are at a disadvantage in the struggle for survival. They are more likely to be invaded and plundered or annexed than large states, and less likely to effectively resist. There are exceptions: small states can exist thanks to the rivalry of proximate big states, whose competition serves as a de facto guarantee of independence. Over long historical periods, however, these guarantees have proven unreliable as the balance of power between rival states is never constant. Belgium learned this to her cost in the First World War, as did the Netherlands in the Second. The nation-state succeeded the dynastic state and the imperial state simply because it was uniquely successful at creating a semi-homogenous ethno-linguistic polity with a shared national myth, and sometimes with a shared religion. This greatly reduced friction and the costs of unity, allowing the nation-state to dedicate more resources to more productive tasks - like capital formation - rather than the buying off of citizens and elites. The map of modern Europe is the outcome of these organic processes: war, ethnic cleansing and the search for security. Modern Poland was formed from the desire of the Soviets to keep a buffer state between themselves and Germany and by the large-scale ethnic cleansing of Germans out of Western Poland at the end of the war. The Soviet Union fell apart when the costs of corruption and a bloated military establishment outweighed the perceived security benefits of protection from the NATO fascists and created the pre-conditions for an imperial collapse. Something very similar has been going on in Europe. There is a general dynamic at play that partly explains why independence movements have gained strength in recent years. 3. The success of the European Union in creating a common economic, legal and institution framework as well as a common currency has also undermined the benefits of pertaining to a large state. Previously, a large state meant a large market; now, even micro-states in the EU can enjoy equal access and compete in a market of 450 million people without incurring the costs of a loss of independence. Western victory in the Cold War has reduced the threat of military conflict while the success of the European Common Market has reduced, though not wholly eliminated, the economic incentives offered by large nations. The more successful the EU is in building institutions and integrating markets, the smaller those advantages will become. The United States is an excellent model to understand how this dynamic is operating: a nation with militarily weak neighbors and great distances isolating its core from potential adversaries, the Union reduced security and economic costs sufficiently that small regions like Vermont and Maine had no qualms breaking off from larger, wealthier, more populous states like New York and Massachusetts respectively. Under similar conditions, the Scots and the Catalans are reacting in a similar fashion. That has an important policy implication for the “NO” campaign in Spain and Britain. One of the key arguments made against separation is that the newly independent states would be outside of the European Union and without access to all of the economic and security benefits previously mentioned. There is a major flaw in this argument: the costs borne by the disaffected regions for remaining in the undesired union are permanent, whereas no one believes that their exclusion from the European Union will be for very long at all. What are five years before you have both independence and the benefits of the EU when you have been waiting for centuries? That is a difficult calculus to argue with. This model helps explain why the equilibrium cost of any given state will vary by its geography, its ethno-linguistic homogeneity, its population, the size and wealth of its shared economy and its external threats and opportunities. It helps explain why a region like Catalonia might find itself outside of the “rational” borders of a Spanish state: it is distant from the political center of Madrid, geographically part of the Western Mediterranean economic basin rather than central Iberia or the North Atlantic, ethnically similar but linguistically different, and of a size and wealth to be viable in the low threat environment that is Western Europe[vii]. The same argument can be made for Scotland, whose parliament approved the Act of Union in 1707 largely because the Scottish elites and emerging merchant classes were desperate to access the large and prosperous English colonial empire and markets. States not only provide security from invasion, privileged access to an internal market, and a legal and institutional framework that provides stability and reduces risks to owners and investors in property. They also concentrate power and distribute benefits; and the greater the degree of centralization, the greater the concentration of both power and benefits in the center. To the extent that the access to this power and the distribution of wealth and benefits is viewed as relatively equitable across diverse segments of society, friction is reduced. However, if the centralized state becomes overly extractive, closed to outsiders, and overtly corrupt, friction increases rapidly in the more distant and diverse regions. This friction may again rise to the point where either reform of the center or separation from it is viewed as necessary by regions and populations that view themselves as discriminated against. In Spain, for example, the state is widely perceived to be corrupt, not just in the center, but in the regions as well. Political and economic elites divert power and wealth to themselves and their favorites and are undoubtedly responsible for much lower growth than could have been achieved in a state with lower levels of corruption. Not only do they accrue disproportionate benefits to themselves, and actively seek to block access to political power through voting and financing systems heavily skewed in favor of the established elites; in response to the 2008 Great Recession, they have severely cut public benefits, increased taxes, while maintaining their own levels of compensation and profligacy. Spain has become the very definition of the politically unresponsive, extractive state run by a minority clique. This situation impacts all Spaniards; the non-economic perceived costs to the Catalans are higher because of the differences I have already mentioned. The growth in inequality, of unresponsive and corrupt institutions, and the lack of real reform options all severely reduce the benefits of pertaining to a large state. And when those benefits fall and the costs of heterogeneity rise, then the fissures appear and widen. All of these trends have been building for a long time. Thomas Picketty, the French economist who has shot to fame for his recent diagnosis[viii] of the growing inequality in the advanced economies of the West, lays the blame squarely on capitalism. He is mistaken in his diagnosis of the cause: capitalism is perhaps the system that generates the greatest absolute inequality because it is the most efficient system at creating wealth. But extractive elites and inequality will inevitably form over time in any system; that is merely human nature. American economist and social scientist Mancur Olson explored this phenomenon of “creeping inequality” in his brilliant work “The Rise and Decline of Nations”. In this book, Mr. Olson describes how societies grow rigid through the inevitable action of associations, combinations and elites. These groups form for logical reasons: to better organize themselves, to more effectively petition and influence political leaders, etc. Over time, the action of these groups serves to accumulate more and more “undeserved” benefits to themselves: tax exemptions, subsidies, trade restrictions, exclusionary licensing requirements. These effects may initially be very small, but over time, and across all of the groups seeking these benefits, the sum can grow to be very large; large enough to create stagnation in economies and create large distributional imbalances in wealth and power. The longer this process goes on without the interruption of war, revolution or natural calamity, the greater the stifling effect. Significantly, Mr. Olson did not limit his model to capitalist societies alone; this is a general pattern for all political organizations. This process has been going on in the West for decades and Mr. Olson’s model fits the observed behavior of elites in America and Western Europe. We can confidently expect the rising tide of inequality and political estrangement to continue. So long as it does, the elites running the central state will be unable to adequately deal with regional demands for greater access to wealth and power. The wider implications are frightening. Scotland and Catalonia may be just the beginning. Similar conditions continue to exist in other European nations like Italy, Belgium, Romania, even France. Canada has a potentially restive Quebec, while Mexico has experienced separatist movements in Yucatan and Oaxaca in its history. Even the United States might not be immune: the danger signs are all there. An elitist Congress of millionaires with single digit approval ratings, and imperial Presidency and a radicalized Supreme Court hardly inspire much political confidence. Meanwhile inequality grows, the middle and lower classes stagnate, and the wealthiest elites visibly flout the laws and literally get away with murder as they entrench their positions. That is all very combustible material. Nor should more authoritarian states sleep any easier at night. China has numerous minorities that it is continually repressing in favor of the Han majority; Russia continues to be composed of a diversity of non-Slavic people who yearn for independence, most notably the Chechens; perhaps only North Korea is ethnically homogenous enough to outlast them all. The answer to separism in the West is obvious to formulate, nearly impossible to implement. Political reform that opens access to centers of power to all groups of citizens; economic and fiscal reforms that reduce inequality and increase benefits flowing out from the center to the peripheries; serious and sustained efforts to eliminate corruption and inefficiencies from markets and public goods. All of these actions will significantly reduce “friction” and decrease the likelihood that minority populations will feel discriminated against. In other words, the answer is more democracy, more transparency, more citizen empowerment: it is most certainly not more repression. Good luck with that. Elites are not known for their generosity in sharing power once acquired. On Friday morning, we may wake up to an independent Scotland[ix]. If that is the case, I wish the Scots well. May they craft a new constitution and new institutions with wisdom. I also hope with greater fervor that the elites of other nations, especially my own, take note: once the genie is out of the bottle, it is almost impossible to get it to go back in. Perhaps the dual shock of Scottish and Catalan independence will be enough to get them to accept the need for the urgent reforms I mentioned previously. If not, more dominoes will fall. [i] In 2008 the Partido Popular organized a public campaign in opposition of the proposed reforms to the Catalan charter of autonomy, then being debated in the Spanish legislature, which would have granted greater fiscal authority to the Catalan Generalitat, in line with that enjoyed by the Basque Country (Euskadi). The main theme of this campaign was "the Catalans want to rob us" (los Catalanes nos quieren robar). [ii] The definitive work on the subject is "Nations and Nationalism Since 1780: Programme, Myth and Reality" by Eric Hobsbawm, the illustrious British-Austrian historian. [iii] The Seven Years’ War, or the French and Indian War as it was known to the American colonists, was largely a continuation of the previous War of the Austrian Succession, with a defeated France and Austria spoiling for a fight with the victorious British and Prussians. It began in 1754 with a French attack on British-held Minorca. Prussia's King Frederick the Great invaded Austrian ally Saxony to prevent a joining of their forces with those of the Habsburg Empress Maria Teresa, which were already massing. Prussia was allied to the United Kingdom, as the Kings of England were also the rulers of Hanover, while the French and Spanish Bourbons were allied to the Austrian Habsburgs, who were also allied to the Russian Romanovs. This led to fighting across Europe, from Gibraltar to Poland, as well as major conflicts in French and British North America, in the Cape Colony of Southern Africa and on the Indian Sub-Continent. [iv] The American Revolution anticipated the French Revolution in many ways: the citizen soldier, the unifying national symbols, the deliberate hearkening to Greco-Roman models, the ubiquity of a political active and literate citizenry. 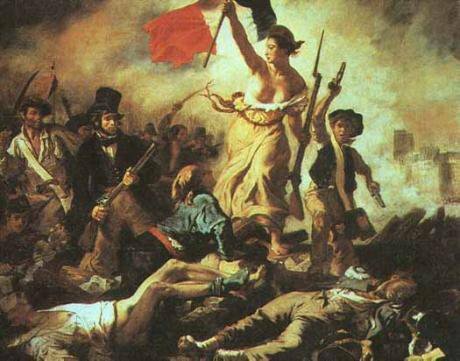 Our revolution was nevertheless too distant from Europe to have the same geopolitical impact as the French Revolution; and it was also incomplete, as the individual states remained as potent foci of power and loyalty for citizens. It would not be until after the Civil War that "these United States" became "the United States". [v] This does not mean that there was no concept of "Spaniard" prior to that time; simply that it was not based on the same concepts of citizenship and belonging to a Fatherland or Motherland shared with a common ethno-linguistic group of people. [vi] My arguments are heavily influenced by the work of two Italian political scientists at MIT, Alberto Alesina and Enrico Spolaone, who wrote"The Size of Nations" in 2003. This is a brief summary of their far more complete and analytical work. [vii] The “optimal” size of the Spanish state was larger when it was threatened by external powers like France, England, the Barbary States and the Ottomans; and when it had a large colonial empire within which its citizens enjoyed a trading monopoly. The benefits of pertaining to that state were correspondingly larger. [ix] Not really; even after the referendum, Scotland will remain part of the United Kingdom until the terms of the separation are negotiated.